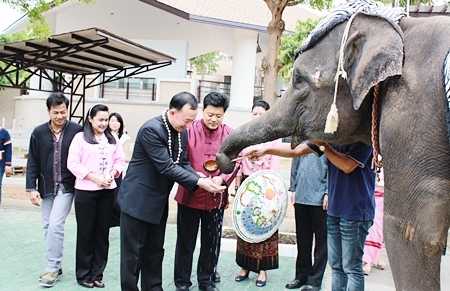 Robinson Department Store officials from Central Airport Shopping Center paid their respects to Chiang Mai Governor in a Rod Nam Dum Hua ceremony on April 15 at the ceremony held at the Governor’s Residence at Nawarat Bridge. Dr. Sarawut Srisakoon, CEO of Chiang Mai Night Safari, pays his respects to President of the Culture Council Dr. Chao Duengduan na Chiang Mai at the Night Safari on April 16, 2012 in a traditional Rod Nam Dum Hua ceremony. 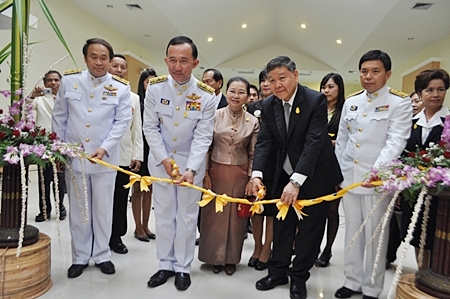 Chiang Mai Governor ML Panadda Diskul opened the new photographic exhibition at the Royal Rajapruek Park on Friday, April 6, 2012. The exhibit features photos taken of the recently concluded Royal Flora Exposition at the Park and will be on display until Wednesday April 18, 2012 at Exhibition Building 2. 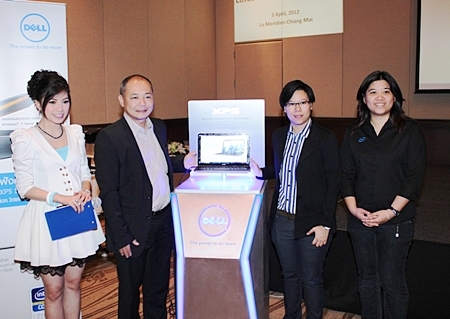 Apipol Likhasittananon General Manager of Dell Corporation (Thailand) Co., Ltd. (2nd from left) Lisita Suthararoj Marketing Manager (2nd from right) and Sanatsa Inthaiwong Representative of Intel Microsoft (Thailand) introduced a new DELL XPS 13 at Le Meridien Hotel Chiang Mai on April 3, 2012. Chiang Mai Governor ML Panadda Diskul and Dr. Sarawuth Srisakul, Chiang Mai Night Safari CEO joined in the Songkran ceremony of splashing water with one of the Night Safari’s elephants on April 10, 2012. The Chiang Mai Night Safari announced the naming of the new baby white tigers at the event, choosing the name from over 700 sent in from around Thailand. The names chosen were Hong Kwan and Panpon, both representing Lanna culture. The winner was Chiang Mai resident Pallapha Khampuang who will receive 2 free tickets to the Chiang Mai Night Safari valid for one year.